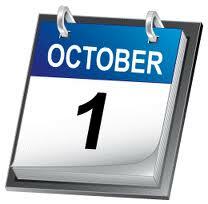 Today is October first, the start of a new month. It’s also Monday, the beginning of a new week. Some people might think, “so what? It’s just another day.” In the whole scheme of things, that’s true. We still have to get out of bed, go to work, and carry out the daily activities that make up our life, no matter what the date is. But I am all about new beginnings and to me the first day of a week or month, or a year or decade, is symbolic of having a fresh start to do better than I did the previous week or month. So on the calendar today, I was elated to see the double “new beginning.” Straight away I made three lists, one for today, one for the week and one for the month, comprising writing tasks, chores, errands and goals. Do you work from lists? I always have. They help me to stay on course and give me sense of accomplishment as I cross off each item. I have even been known to add to my list a task that wasn’t on it but that I completed, just so I could cross it off and at the end of the day feel good about my efforts. To make it an even more satisfying undertaking, there are now all kinds of productivity apps available to help you keep track of your chores and objectives, and yes, I have a few of those on my iPad. And yes, I use them. However, lately I haven’t been so dedicated to completing my tasks, and from one day to the next I list the same things over and over because I haven’t yet crossed them out. I’m not exactly sure why that is. I understand that fulfilling objectives is all about commitment and self-discipline no matter what excuses I come up with (and I can certainly come up with plausible excuses: middle age, the distractions of living in Bermuda, the heat and humidity, time spent with friends and family). But nevertheless, l keep not completing my lists and even though it is only me that is holding me accountable, I berate myself and promise to do better the next time. So this morning, the start of a new day, a new week and a new month, I have a fresh piece of paper on which I’ve written a new list (with a few old items on it) and I am, at least for the moment, committed to crossing off all those tasks and achieving those goals. I’m off to a good start. Because number one on my list is to write a blog. On to number two..
Do you always complete your lists?